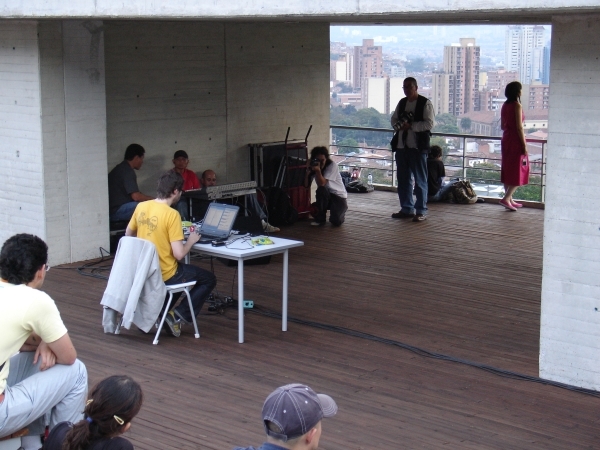 PA system, computer-based audio manipulation system, table, chairs and performance space atop a library. Medellin is the second largest city in Colombia. The city centre is in a valley with buildings stretching up both of the steep sides. 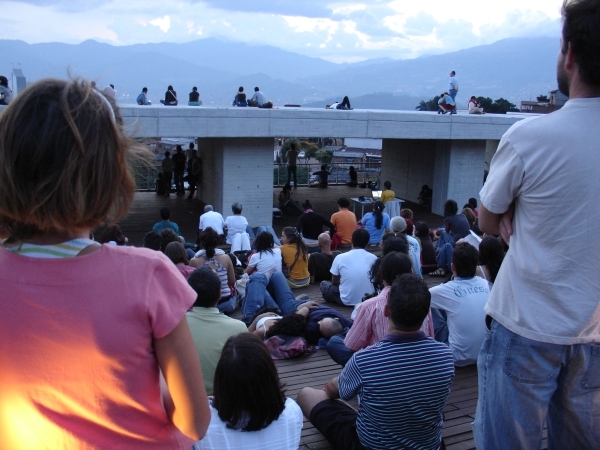 I travelled there in April 2007 at the request of curator Ana-Paula Cohen, to take part in Encuentro de Medellin - a city-wide contemporary art event. 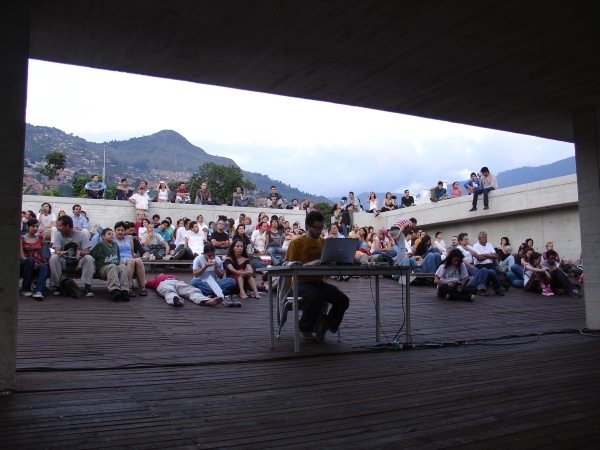 I was interested in spaces that had recently been created in the city, spaces in transition, and Ana mentioned La Ladera, a newly constructed library sited half way up the side of the valley. 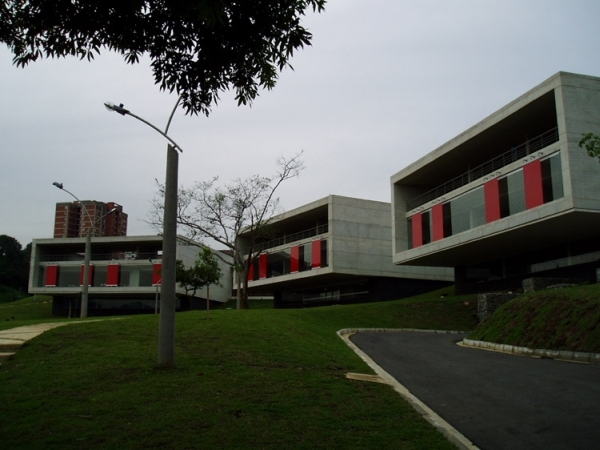 This cluster of three interconnected buildings was constructed on the site of a former prison as part of a scheme, instituted by Mayor Sergio Fajardo Valderrama, to place libraries in four of the cities most neglected barrios. His belief was that these structures would act as tools for social regeneration. As well as a library, La Ladera housed a computer room where people could get free internet access, incubation centres for small businesses and a cafe. La Ladera is built into the side of the valley and we climbed some steps up the slope at one side to find ourselves at roof-level. 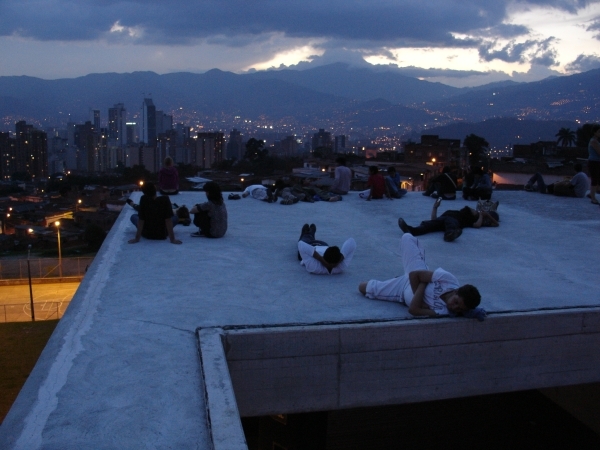 The architect's design incorporated two open-air spaces on the roof, each with a ramp titled toward a concrete structure which framed a view of downtown Medellin. I agreed with Ana that it would make a good location for a sound performance, so we had some meetings and made arrangements to stage it at magic hour the following Sunday. Magic hour is the Hollywood term for dusk - the period of time when the light is changing, when day is turning into night. I'm interested in it as a time of transformation and possibility, when the everyday is made new and the familiar rendered strange. It's a time of sensory exchange, where hearing becomes as important as seeing. We advertised the performance with posters in the neighbourhood around La Ladera and in the city centre, near the focal point for the exhibition's activites. The following Sunday, I sat at a table in the amphitheatre, connected my computer to a rented PA system and began to improvise a soundtrack to the view out over the city. I used the computer to mix sounds together - creating an aural flow - using sound to slow down time and amplify the NOW. The performance lasted about an hour. It was dark by the time I had finished.